A Gentle Occupation analyses Dutch military operations in the aftermath of the 2003 US-led invasion in Iraq. It raises the question why, in contrast to most allied troops elsewhere in Iraq, Dutch forces in Al Muthanna province met with little resistance and left Iraq self-confident of their ability to deal with this type of stabilisation operations. Using previously classified documents and interviews, Ten Cate and Brocades Zaalberg examine the way the Dutch government consciously framed this mission as different from the American and British occupation and often in contrast to the actual situation on the ground. They unravel the widespread idea of a unique and superior ‘Dutch approach’, by detailing tactical operations and contextualising the Dutch actions within the larger experiences of the Coalition Forces. Ultimately, the authors argue that despite effective tactical reflexes by Dutch commanders, stability in Al Muthanna was conditions-driven rather than the result of a unique national approach. 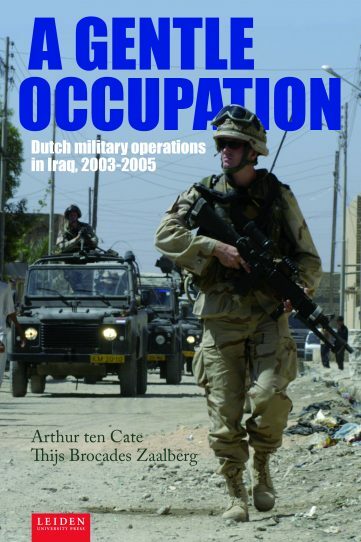 Arthur ten Cate is Senior Researcher at the Netherlands Institute of Military History (NIMH) in The Hague, where he specializes in contemporary military history, international military interventions and special operations warfare. Thijs Brocades Zaalberg is Researcher at the Netherlands Institute of Military History (NIMH) in The Hague, where he focuses on colonial warfare, counter-insurgency and peace operations. "This book is a wonderful contribution to the literature on military operations in Iraq and is written in a dispassionate and objective manner. It is works like this that can indeed help in the establishment of grounded narratives about what happened to the European militaries during their deployments in these wars. It is a book that should be read and carefully digested by military professionals, historians, and policy practitioners alike." "A Gentle Occupation is very well done and a valuable addition to the literature on operations in Iraq. It looks good, reads well, and is very objective." "This is a very well written, extensively researched book that will fill a niche (particularly in the English language) on the role the Netherlands played in the initial phase of operations in post-Saddam Hussein’s Iraq. It will be of value to a specialized audience including the military, policy makers, and political scientists."